First Appearance: Spawn # 5. Powers/Abilities: None. What's the Story? : A psychotic serial killer who preyed upon children, Kincaid was the pawn in a power struggle headed by Jason Wynn. Detained regarding a child's disappearance, Kincaid was released on his own recognizance through Wynn and police chief Banks' manipulations, and pointed towards the daughter of U.S. Senator Jennings, who was threatening Wynn's power at the time. Kincaid kidnapped and killed the senator's daughter, as expected. The grief-stricken Jennings hired Al Simmons to murder Kincaid, but before Simmons could pull the hit, Kincaid was arrested, and sent to prison on a lesser charge. Five years later, Kincaid was released and returned to his murderous ways. 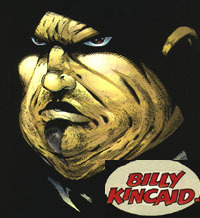 Not wanting him to escape again, Simmons, now Spawn, captured and killed Kincaid, leaving the body in the office of Detective Williams and Burke, Kincaid's soul went to Hell, where, ironically, he now serves Malebolgia as a lesser Hellspawn.